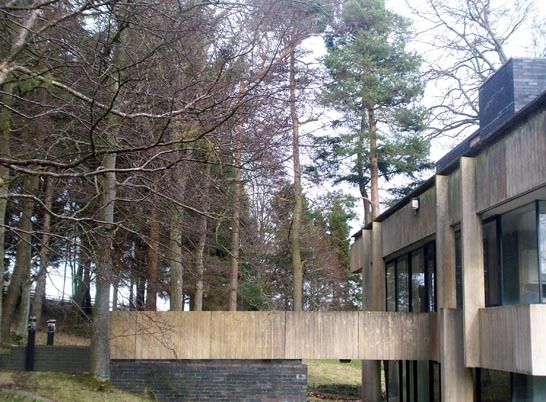 This design studio for textile guru Bernat Klein is a seminal building by the Borders based architect Peter Womersley, completed in 1972. Its design stems from a Miesian ethic and echoes the canon of 20th Century creations practically quoting Wright’s Falling Water and Johnson’s Farnsworth House. 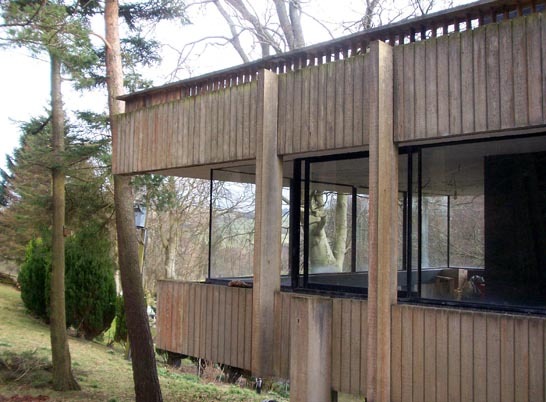 The listed status of the building was upgraded in 2002 making it then the most modern Grade A Listed Building in Scotland. 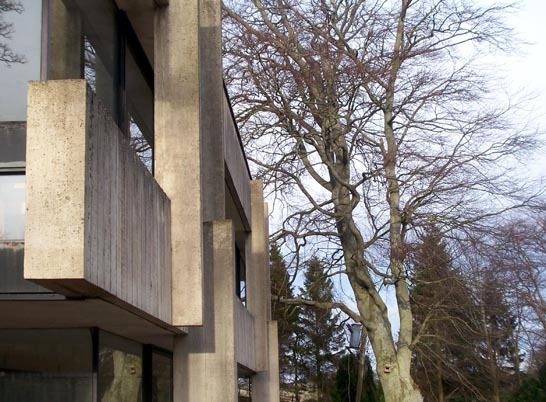 It has since been voted by peers as being the 5th most influential building built in Scotland over the last 50 years. Its elegant, complex structure works over two main levels and must have been designed with a certain drama in mind. 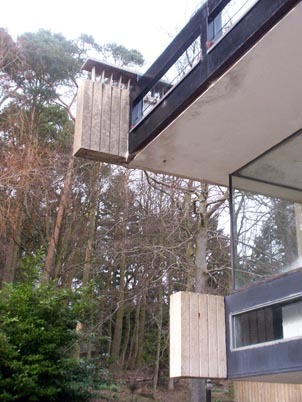 Klein would have arrived at the upper level via path through the woods from his house, High Sunderland, also by Womersley. The path connects with a bridge extending from the first floor of the studio and visitors would have encountered the theatre of entering on the ground floor and rising through the supporting core to meet Klein in his piano nobile. 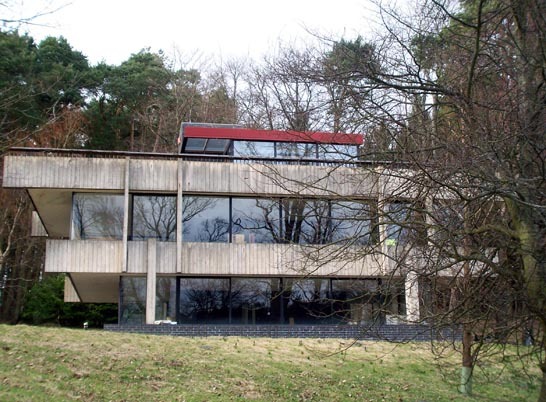 Upon Klein’s retirement the building was sold and became a textile interpretation centre and subsequently was bought by our client after the owners went into administration. We won Planning Permission and Listed building consents to bring it to life as a weekend retreat and work is ongoing. Our proposal returns the interior to the open plan format from recent unsympathetic office use. The energy use of the building has been minimised with the addition of roof insulation and double glazing where appropriate. 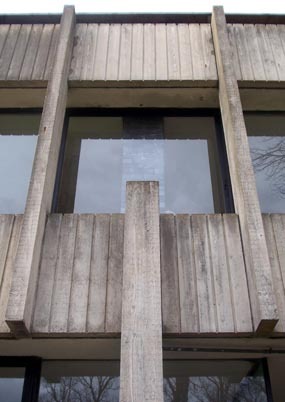 The roof has been conceived as a terrace and together with the insulation work this has necessitated a new handrail which has been designed in oak to follow the detail of the concrete shuttering. Consent was also granted for a rooftop sun space which relates proportionately to the whole, following the rhythm of the existing glazing.